Please measure and provide the actual head measurement as described in this listing. 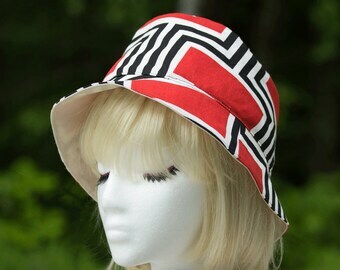 Red, Black & White abstract graphic beach hat. 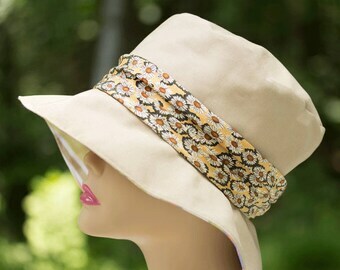 Reverses to neutral cream solid with hatband. 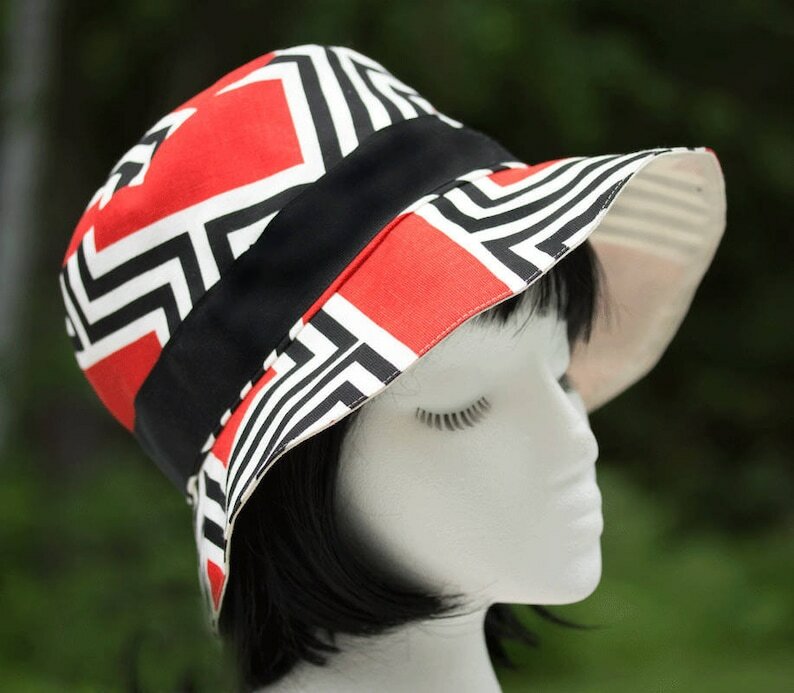 Cool cotton sun hat is sewn with a bold abstract graphic in red, black and off white with a 1-1/2" solid black grosgrain ribbon hatband. It's reversible to a neutral off-white cream also in cool cotton. 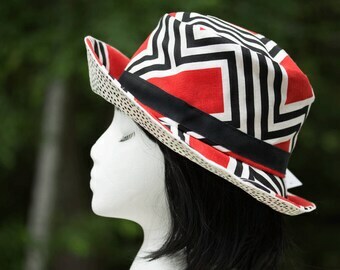 The grosgrain hatband is 7/8", striped in black, red and beige. Measure around the head just above your ears and across your forehead to within 1/8" or 0.1cm, then select the closest size range. Include the actual measurement with your order. Each hat is carefully packed in tissue paper, then inside a plastic sleeve tied with ribbon, then inside a sturdy box surrounded with additional clear packing tape to keep moisture and travel grime from entering the box. 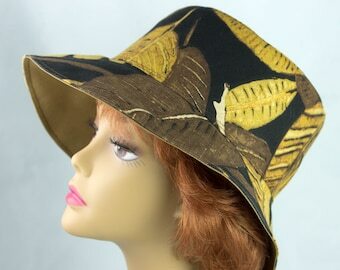 I looked for a large and comfortable hat that is not too warm. I did not want it to be made of wool because my skin is sensitive to wool. I asked to mail me one without a button and I was happy to receive it that way. I measured my head and size Large was the right size for me. I get a lot of compliments. It's pretty, comfortable, and warms just enough. It came in a box with lovely wapping paper and greeting card. Thanks! Love it!!! I'm a very happy and satisfied customer. Exactly what I was looking for! Shipped promptly, packed carefully, arrived in excellent condition. Highly recommend this shop! What's the best way to measure my head? Measure circumference & dome. Identify shape. 1) Use a measuring tape or ribbon that DOES NOT STRETCH (not a string) around the widest part across mid-forehead and just above the ears--three times and take an average--to the last 1/8" or 0.1 cm. 2) Measure the dome from mid-forehead over the top to that divot just below the skull at the nape. Average is 13" for women, 14" for men. 3) Determine head's shape: oval (average), round or elongated-oval. Bow and ask a friend. For hard to fit heads, the extra attention to detail makes a big difference in fit. Why? 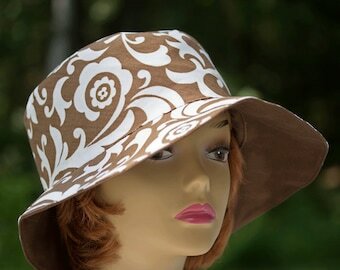 because an average-shape hat feels tight on the sides of round heads or doesn't rest properly on tall/flat domes. Yes. 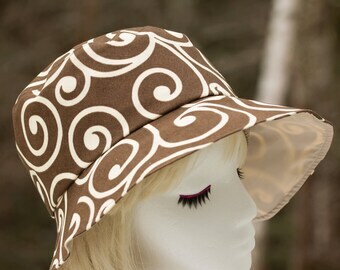 If a hat can be sewn, I will make it after it's been ordered. 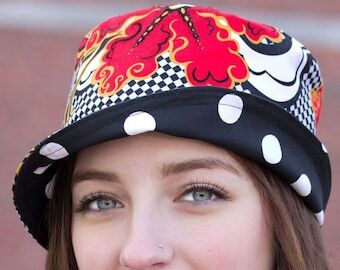 Pick any hat and request any modifications desired in the comments section of the order process. 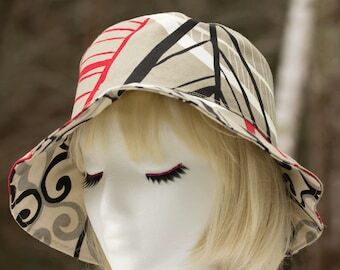 Or describe something completely new so a private listing can be posted for you that itemizes its description, but without a photo of the completed hat, of course. Do I accept returns of a custom order? Sort of, because each hat will fit someone somewhere in the future. Or I'll make alterations (see how to measure). Hats should be spot clean unless otherwise directed. First, use a sticky tape roller to remove dust and debris. Allow whatever is wet to dry and then scrape it off with a fingernail or toothpick. If the spot is not removed after that, then using a clean white paper towel dab with water and a smidgen of white vinegar from above while having a clean dry white paper towel below until there is no color. Use lots of paper towels. 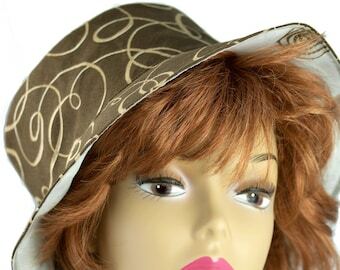 To re-shape, if needed, stuff the hat with socks, or stretch over a salad bowl or clean paint can that's close to your head size. Worst case, use steam carefully and the fabric will settle into that shape. 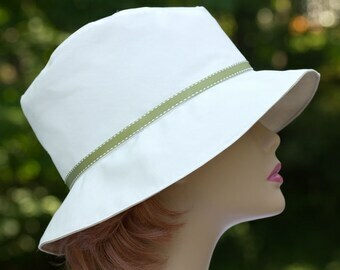 Most hats can be enlarged with a hat stretcher. It's a matter of moisture, temperature and time (see Anneal). About choosing colors and what is Pantone? Humans evolved with poor color memory. That's why it's difficult to describe burgundy when you really mean maroon. Or describe tan as off-white. Pantone is a company that helps mitigate that discrepany by using a numbering system to describe colors, shades and saturation. When choosing a color such as grey (gray to some), your concept of steel gray could be my medium gray. To avoid guessing, just Google 'Pantone gray' and you will see many results for shades of gray. Pick a Pantone number for the one you prefer and include that in your order comments. That way, despite variations in monitor color rendition, I will be able to deliver a color that comes closer to the one you desire. Always provide a current measurement in the order comments. Just ask for any dimension in order comments. Please see tips on how to measure. What shipping class should I use? Priority Shipping is available; however USPS First Class shipping is more economical. In my experience, First Class items arrive in a similar timeframe as Priority Shipping about 80% of the time. If you absolutely need an item to arrive sooner, choose Priority. But if you can accept an 80% chance it will arrive in a similar timeframe, choose First Class and save about half the cost. Either way, shipment tracking is always included.